"Words cannot describe how impressed I am. 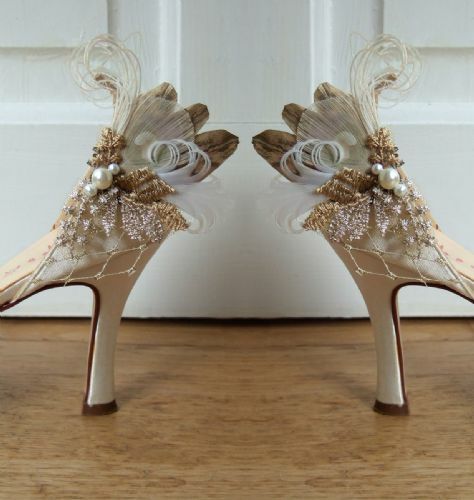 Suddenly my £60.00 John Lewis shoes, look like >£600 Jimmy Choo or Valentino Couture Bridal shoes. What an amazing idea.... So pleased I spotted these on Instagram. 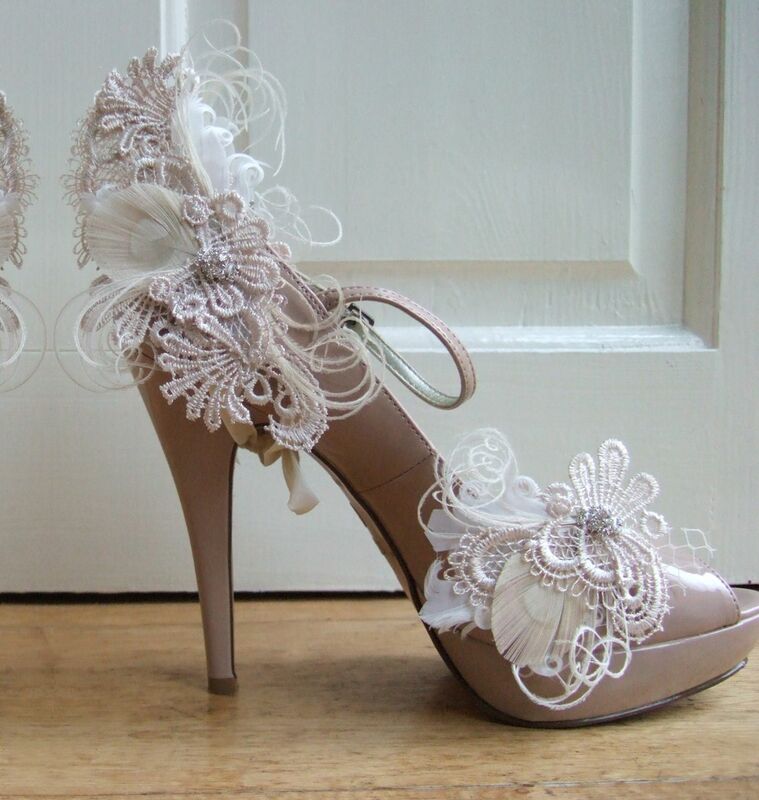 I'm following @Dress2Impresshats constantly for new ideas now x"
A pair of beautiful handmade to order in 7 working days, Shoe clips and Heel Wraps Set called "Zia". The Shoes are Not included. 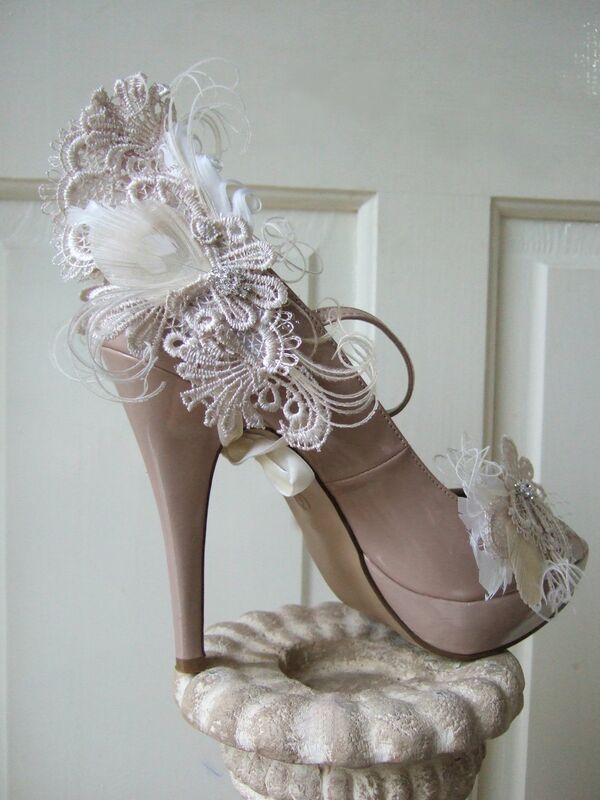 You are buying the Clips and Lace / Feather Heel Wraps that clip onto your existing shoes. 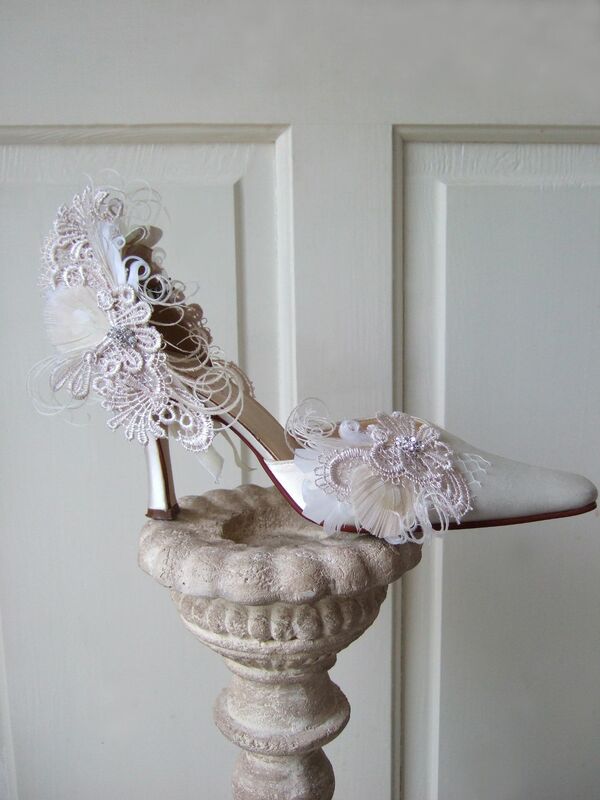 A Pair of Hand Made in the UK, Bridal Weddings Shoe Clips and Wraps for the Heels in Feathers, and Guipure Lace in White, Cream and Palest Beige, and Crystal Clusters. You are Buying one Pair of the Lace Feather Clips AND One Pair of Feather and Lace Heel Wrap Clips. THE SHOES ARE NOT INCLUDED. The Heel Wraps go around the entire back of the shoe, clipping with two clips at the top, and tie with Ribbon on the underneath. 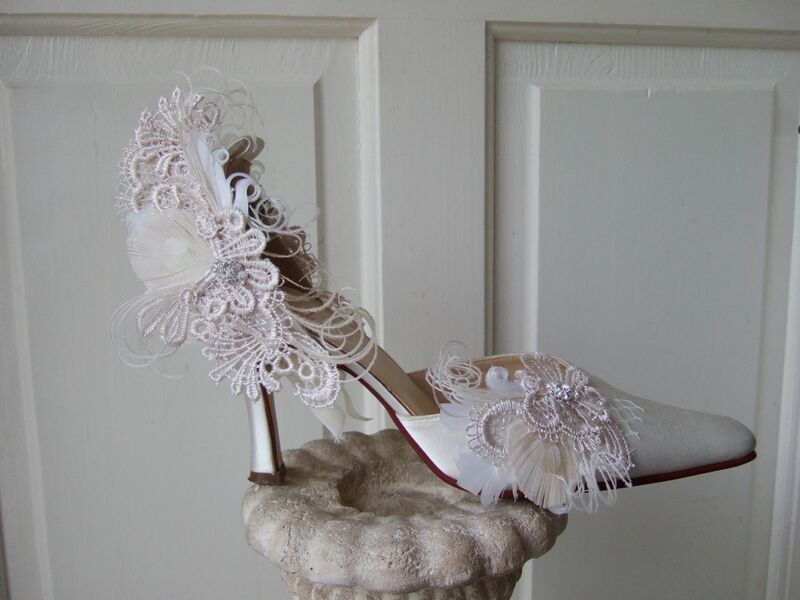 as you can see in the pictures, this one design can work on different designs of shoes simply with the two clips at top, and then tie accordingly underneath. I wouldn't recommend for a low or flat shoe though, as the deco would reach the floor. The clips at the front can be worn either side or at the centre of the toes, depending on your preference. 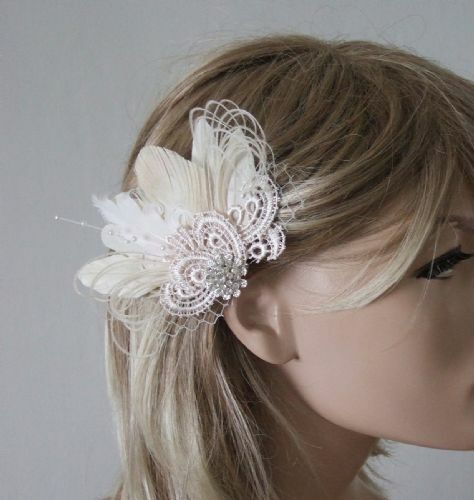 Really Pretty for those wearing Vintage Lace Dresses, or adopting the Vintage Inspired or Rustic Themed wedding. 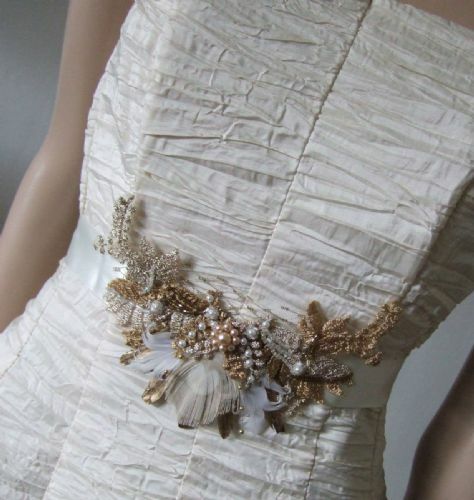 But also a really fantastic way of glamming up a simple wedding dress, but wearing laced / feather accessories instead. 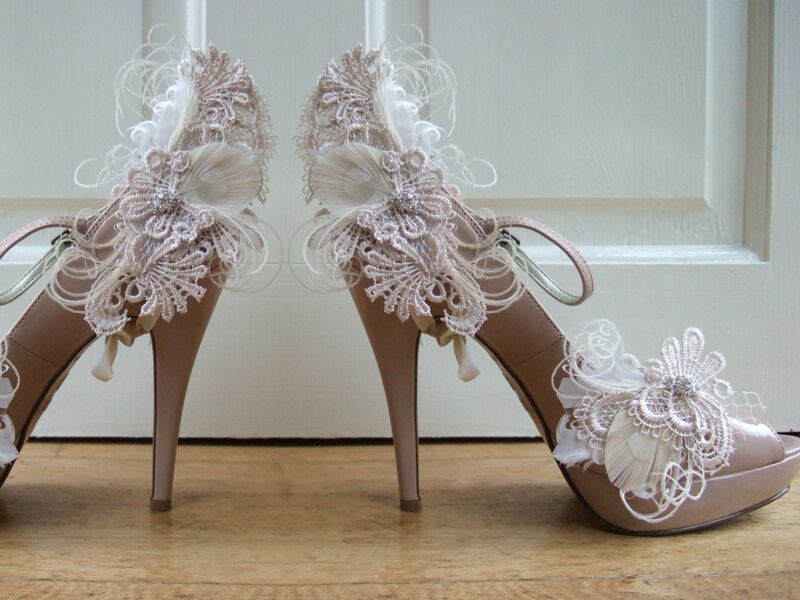 The Shoe clips and Heel Wraps are a fantastic idea for transforming your plain bridal shoes into couture looking shoe to compliment your dress, wedding theme and head wear. You will received Two Heel Wraps (one for each shoe), and Two Shoe Clips. CAN BE CUSTOM MADE with Other Colours by Request. Please contact me on enquiries@dress-2-impress.com and let me know your wedding colours, I can discuss options. Made with the best "shoe clips" - French Bluette clip, made specially for shoes. They are comfortable, easy to use, long lasting and don't damage the shoes.